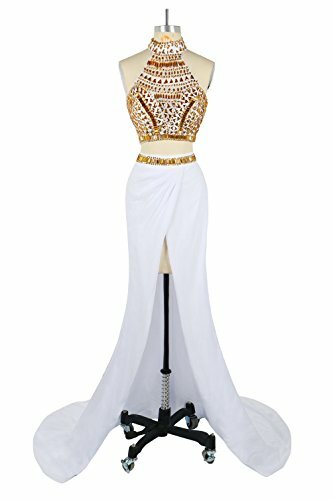 Elegant White Two Piece Mermaid Prom Dresses High Slit Chiffon Rhinestone Beaded Evening Gowns. Perfect for bridesmaid dresses, evening dress, prom dress, homecoming dress, cocktail dress, birthday wear and formal special occasion party dresses. Color: The real color of the dress may be a little different from the pictures shown on amazon due to the monitor. Size: For accurate measurements of Bust, Waist, Hips and Hollow to Floor, please kindly refer to our Size Chart Picture. Materials: High Neck Style, Gold Crystal Beaded, Concealed Zipper at Side, High Split Dress. Note: Please choose size according to left size chart. Please email us your detailed measurements and color if you would like customize this dress. Time: We generally need 7-9 working days to finish this dress. If you would like to rush order. Please email us the date when you hope to receive it. This Maxi Dress is perfect for the evening gowns, prom dresses, bridesmaid dresses, cocktail dress, formal party dresses and so on.